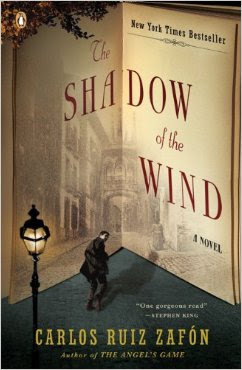 I would like to recommend The Shadow of the Wind by Carlos Ruiz Zafón as a kind of Valentine’s Day present between guy and gal book lovers, because it incorporates two good romances in a way that shouldn’t send the guys screaming for the exits (like the Brontë sisters, Jane Austen, Georgette Heyer, Stephenie Meyer or any of the thousands of lesser romance writers). It crosses several other genres, including literary fiction, a historical novel about a very interesting period, a good mystery, and a blushingly explicit love letter to books, reading and libraries. Very ambitious – I think the author was aiming for Tolstoy (the working title for Anna Karenina was "A Tale of Two Marriages") and he weaves in romance in a similar manner. I think it would be a great book for aspiring writers to read for ideas from a really well written book that was a huge crossover commercial and critical success worldwide. It should be easy to get this through your local library or library network. If any of your readers are fluent in Spanish, it would be interesting to hear their thoughts on reading this in the original language. The Shadow of the Wind is the first in a four book series called “The Cemetery of Forgotten Books”. The fourth and final book in the series was just published in Spanish in November 2016 and the English translation is expected in 2017. All of the English translations have been done by Lucia Graves, the daughter of English poet and writer Robert Graves.